EXECUTIVE SUMMARY: Accusations of dual loyalty are the main anti-Semitic hate motif worldwide, as well as in the US. 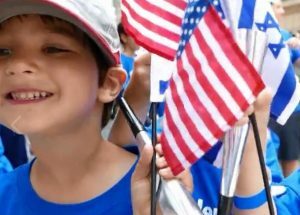 Extrapolating from poll data, it can be inferred that up to seventy-five million Americans might believe their Jewish co-citizens are more loyal to Israel than to the US. If that were true, the great majority of American Jews would likely have voted for Donald Trump, who is proving so far to be one of the most pro-Israel presidents in history. Yet only 24% of US Jews supported him in the 2016 elections, and in the newly elected Congress, a host of Jewish Democrat committee heads are expected to attack the president. The 2014 ADL Global 100 study also found that the false accusation of dual loyalty is the main international anti-Semitic stereotype. Forty-one percent of the world populations included in the survey believe this to be true, which, if extrapolated out to the total populations of those countries, would translate to approximately 1.7 billion people. This huge figure provides fertile ground for many other anti-Semitic tropes. If the interests of Israel are opposed to those of the country where a Jew lives, an anti-Semite can accuse the Jewish citizen of siding with the Israeli interest – saying, in effect, “you are not really one of us.” In its most extreme form, the charge of dual loyalty amounts to an accusation of treason. The charge that Jews are not loyal to the society or country in which they live existed long before the State of Israel was founded. During the mid-fourteenth century, at the time of the Black Death, Jews were burned on the accusation that they had poisoned food, wells, and streams. There have also been multiple variations on this theme. One was that Jews were cosmopolitans, a people without a homeland who were loyal only to other Jews. That was the basis for the accusation of treason and subsequent conviction in 1894 of French officer Alfred Dreyfus. As a Jew, he was the ideal scapegoat for espionage that had been committed against France by another man, a non-Jewish officer. Accusing Jews of dual loyalty creates further anti-Semitic stereotypes, such as the belief that Jews want to control the world. The 2014 global ADL study shows that 29% of those interviewed worldwide believe Jews have too much power over global affairs. In the US, a 2015 ADL study revealed that 16% of Americans surveyed (extrapolating out from that percentage, that would be 40 million Americans) believe Jews have too much power in the business world. The same proportion said they believe Jews have too much power in international financial markets. Twelve percent were of the opinion that Jews have too much control over the US government, while the same proportion thought Jews have too much control over global media. Extrapolating these results into the total population, the study can be interpreted to imply that twenty-five million adult Americans believe Jews have too much control over global affairs. During the Obama administration, a substantial disagreement occurred between the US and Israeli governments regarding the Iranian nuclear agreement. Jewish Senator Chuck Schumer voted against it and was then accused of being more loyal to Israel than to the US. The most extreme modern American case of an accusation of dual loyalty was Jonathan Pollard, who was convicted by the US of spying for Israel. He is the only person ever to have received a life sentence for spying on the US on behalf of an ally. It is easy to show that on basic issues of great importance to Israel, the accusation that American Jews feel a dual loyalty is a slander. So far, Donald Trump has been an extremely pro-Israeli president. If US Jews did in fact feel a dual loyalty, the great majority of them would likely support him. Yet in 2016, 71% of them voted for Hillary Clinton, far exceeding what she received on the national scale (48%). Only 24% of US Jews voted for Trump. In the newly elected Congress, a host of Jewish Democrat committee heads are expected to attack the president in a major way. There is ample further proof that the concept of dual loyalty among American Jews is false. Barack Obama was among the least friendly US presidents to Israel, yet US Jews voted for him in huge numbers. In 2008, 78% of them voted for Obama as opposed to 53% of the national vote. In 2012, 69% of US Jews voted for Obama versus 58% nationally. A majority of US Jews voted for Obama seemingly against their own interests. He and his wife were longtime members of a church whose then pastor, Jeremiah Wright, is an anti-Semite. The dubiousness of dual loyalty claims against Jews can also be seen in other countries. In a poll in the Netherlands conducted during the 2017 election campaign, it was found that 19% of Dutch Jews intended to vote for the anti-Israeli Labor Party (PvdA) whereas only 6% of the general population voted for it. In Britain, 13% of Jews said they would vote for Labour in the 2017 parliamentary elections despite the fact that the party leader, Jeremy Corbyn, is a friend of genocidal terrorist attackers of Israel and an anti-Israel inciter. Several people around him are extreme anti-Israel inciters. Many countries have problematic diasporas. Dual loyalty can be mild, as in the case of immigrants cheering on their country of origin rather than their country of residence at a sporting event. Sometimes, however, even that can get out of hand. A well-known case was the “friendly” soccer match in 2001 in Paris between France and Algeria. Algerians living in France whistled when the French anthem was played. The match had to be ended prematurely as Algerians invaded the field. Yet accusations of dual loyalty are a specifically anti-Jewish stereotype. The fixation on Jews as uniquely susceptible to the temptation of dual loyalty is illustrated by the lack of interest in the suspect behavior of other groups. Turkey, for example, allows its citizens living abroad to participate in its elections. More than 450,000 Turks, or 65% of those participating in the vote in Germany, supported Erdoğan’s AKP in the 2018 parliamentary elections. This is substantially higher than the percentage of those who voted for it in Turkey. Yet this did not lead to any particular anger in Germany about immigrants backing a foreign party whose views are incompatible with Germany’s democratic norms and values. Finding intelligent ways to expose false dual loyalty claims against Jews may be the beginning of a new type of fight against anti-Semitism. This is an edited version of an article was published on November 15, 2018 by Algemeiner.